When a devotee respectfully comes to the Temple and faithfully sees God in the Deity, it is called darshan. All the supreme Masters of Vrindaban and also Shree Chaitanya Mahaprabhuji have revealed this Divine secret that Radha Rani is the absolute supreme form of the Divine love, the Mahabhao, (महाभाव). She is also the absolute supreme form of Brahm Who Herself is Krishna. During Maharas, Radha Krishna revealed the Bliss of raas ras (the supreme Divine Bliss) to all the Gopis of Braj. This Temple reveals all these aspects of Radha Bhao (Raseshwari Radha Rani as ‘Mahabhao,’ and Raseshwari Radha Rani as ‘Radha Krishna’). That is why it is called Shree Raseshwari Radha Rani Temple. In the Temple shrine, we have the main Deity of Shree Raseshwari Radha Rani seated on the throne in the center; to Her right are the Deities of Radha Krishna together in raas pose; and to Her left is the Deity of Shree Chaitanya Mahaprabhuji. Five hundred years ago, when our acharyas established Temples of Radha Krishna, in places of Vrindaban, Barsana, Govardhan, etc. these places were fully woodlands. 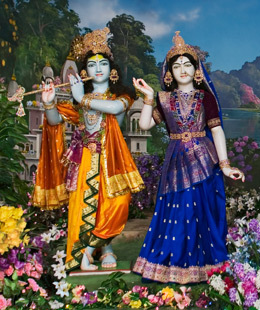 All the loving leelas of Radha Krishna happened in the nikunj areas of these woodlands. Nikunj is a beautiful secluded area where blossoming trees, flowering bushes, creepers and perfumed flowers grow together to create such a sheltered and shaded setting where Radha, Krishna and Gopis would sit, play and dance. Thousands of Temples have been constructed in the last hundreds of years but they do not represent the true nikunj view, which is an important aspect when meditating on Radha Krishna leelas. Considering all these devotional aspects, the Temple of Shree Raseshwari Radha Rani has been created to reveal the real nikunj darshan of Radha Krishna. Thus, this is the first Temple in the world that represents the true devotional view of the nikunj leelas.